The ADP Employment Report this morning showed 201,000 new jobs created in August, much stronger than the consensus forecast of 140,000. It was also reported that new weekly unemployment claims fell by 12,000 last week to 365,000. The ECB also announced its “whatever it takes to save the euro” plan, and at first glance it seems to be substantial and just about what markets anticipated. Where does this latest information leave the Fed in its decision on whether to provide a round of QE3 type stimulus in the U.S.? The Fed’s main concern expressed in the minutes of its last FOMC meeting, and Fed Chairman Bernanke’s speech on Friday, was employment. In the minutes of that last meeting the members decided to be ready to jump in with stimulus, but to wait and see a bit longer. The very strong Labor Department Jobs report for July, released right after that meeting, and today’s even stronger ADP jobs report showing the improving employment trend continues, increases the odds that the Fed will not take action at next week’s meeting either, but will continue to wait and see. The ECB’s decision to take action announced this morning may also add to the Fed’s inclination to wait a bit longer. But then the Fed may also be looking at information beyond jobs, like perhaps the chart below and its implications. Is U.S. Closer To Recession Than We Realize? The stock market is normally a fairly good forecaster of recessions. Oh, I know the old story of how it has predicted 10 of the last 6 recessions. That is, it sometimes it goes down in what seems like the forerunner of a recession, but a recession doesn’t take place. The 1987 market crash is probably the best example. However, looked at another way, in spite of false warnings, there has never been a recession that was not led by, or accompanied by, a serious market correction. This chart looks kind of ominous. It is courtesy of Business Insiders and is a chart developed by Albert Edwards, a strategist at Societe Generale. It shows the progress of the sideways secular bear market since the market peak in 2000, against the backdrop of durable goods orders. 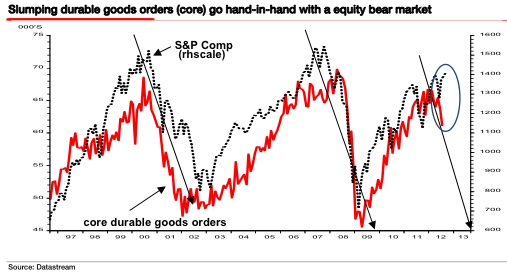 The ‘core rate’ of durable goods orders, that is capital goods orders excluding the volatile spikes and dips of large aircraft orders, has declined for four straight months (the red line). But rather than beginning to sell off as happened in 2000 and 2007, the S&P 500 (the dotted line) has spiked higher, moving in the opposite direction, another indication of the market ignoring what’s happening in the economy, moving on hope the Fed can rescue the situation this time. With its FOMC meeting next week we should soon know. Subscribers to Street Smart Report: There are two new in-depth reports for you in your secure area of the Street Smart Report website. A ‘Gold, Bonds, Dollar, Commodities’ report from Tuesday, and an in-depth ‘U.S. Markets’ report from yesterday.